If there is a characteristic that makes the current conversation on Social CRM so interesting and challenging, it is probably its intrinsic nature inherently disrespectful of departments, business functions, inside-outside boundaries, separate processes. Even only to imagine an organization that is able to generate business value strategically and operationally putting the customer at the center probably requires smoother operations and more transparent, more integrated, more coordinated actions from all the constituent parts. As if you suddenly pass by a group of soloists in separate rooms to an entire orchestra that plays in equilibrium but around the notes of a new musician that nobody knows. Why so giving yourself so much trouble? To transform the challenges of handling a social customer into an opportunity for greater productivity, responsiveness, trust, product quality, smaller costs, recognition of the brand. The question to me is how do not forget everything we put in place over the last decade while taking advantage of this opportunity? 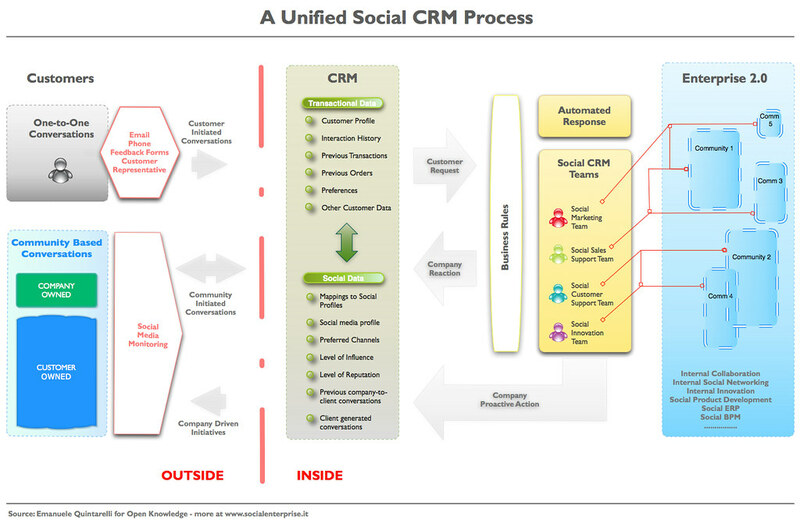 Please read the post in which this model has been presented directly on Jacob’s blog but the basic insights to me are a stronger online-offline integration, the fact that all transactions (social or traditional) are mapped within CRM and the multidisciplinary team the company now needs to come back to the customer. This is a great inspiration and you should also read the good comments (including criticism) that really add to the model. The process is one way only: the company listens to what is said in social media or get information from the direct interaction with customers but there is no proactive action from the organization to the customer. This however is exactly what happens in the most advanced initiatives of Social CRM, i.e as part of social product development. The answer is not social: like pioneers in the Social CRM are well aware, when you launch a new community what you are doing is signing an implicit contract with your audience. We can call it an SLA (Service Level Agreement) or just a set of expectations but users will expect from you real, accurate, timely answers taking into account their wishes. More than answers this is a real change born out of a community based solicitation but quickly crossing the entire company with its processes, behaviors, messages, tools. It is much more than communication .. here the marketing or community management is not enough to give the answers! Every social exchange must be stored: in order to really understand what the customer is asking (perhaps implicitly) and respond not only in a coordinated but also in a consistent way, you must connect the customer profile with its online interactions. I mean every interaction, occurring with the company or with other customers on issues related to the product. As you can easily imagine, the point that concerns me most is the fact that you can not really make Social CRM works (but the same could be said for good social media marketing initiatives) if you are not ready to involve the entire organization, preferably before even starting with social media. Doing this requires an Enterprise 2.0 and a structure that maps external communities to appropriate internal interactions in order to socially produce the best answers and to implement smoothly/profitably the insights from the market. Starting from the inside has also the effect of connecting different silos, helping them to trust each other and to gain the necessary sensitivity, beginnig to work together for the external community without necessarily waiting for the entire organization to evolve in a manner consistent with the needs of social media . What do you think? What is missing or to be improved in this model?